There's zombies in everything now-a-days, isn't there? I'm not really a fan of their pose, but it worked out. 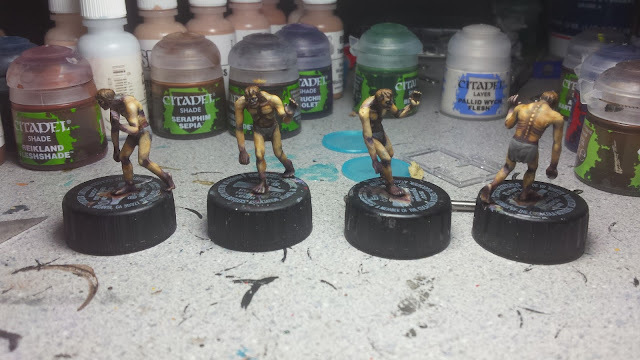 These guys turned out well and I think I've finally perfected my recipe for undead skin tones too. The cult leaders in the book, looked to have white robes on. But having them be all white would have been boring. Instead I opted to give them red and white robes. The staff features a purple gem (the accent color for the entire set). 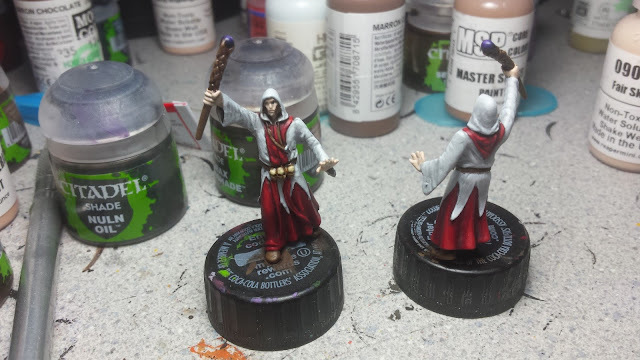 For the cultists, I wanted to tie them to the leaders, so I made part of their robes red as well. 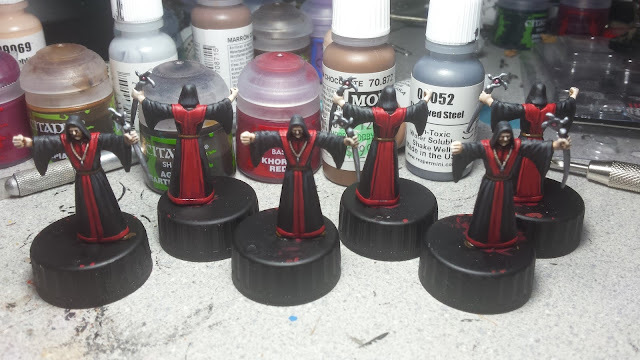 But I also wanted them to seem more sinister, so they also feature black robes as well. Their staves also feature gems, but this time they are more on the pink side (the other accent color for the set). The maniacs were fun to paint. 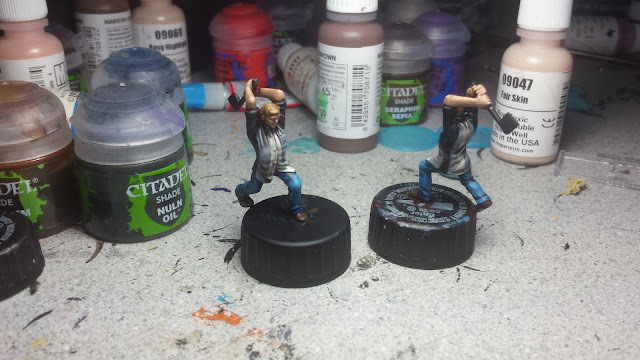 I started with their pants, which were painted dark blue and then drybrushed to give them the look of denim. For their shirts, I was stuck on what I wanted to do. But I knew I didn't want to paint them up in black only, since there's a lot of black already in the cultist robes. So instead, I went with black, grey and white bowling shirts instead. The hounds are the first set of actual monsters I've painted for the set. 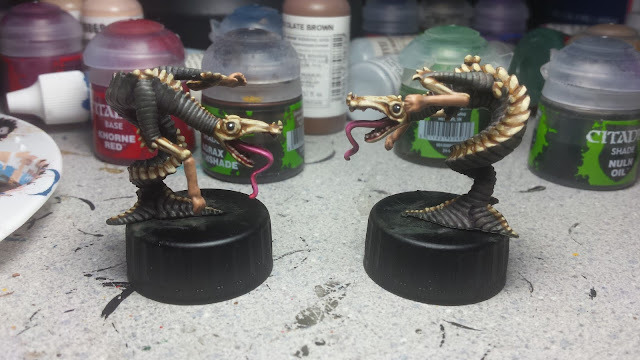 I wasn't sure on how I wanted to paint them, until I realized that their heads look like rat skulls. That sparked the idea of having bone showing throughout. They also have forearms that look like human arms, so I had to paint them up in flesh tones for maximum weirdness. That's it for now. Also finished are the Witches, but I forgot to take a finished picture of them. 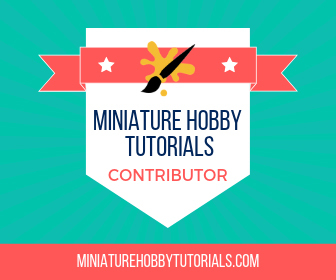 I'll show them off in the next WIP post. For now, you can watch the progress as it happens on Twitter and Instagram. Looking good Scott, you are really cranking through the set. I've got the cultists on my painting table now (also going with a black and red robe). It's fun seeing how you go about each group as there really isn't a 'standard' for any of it. Thanks sir, though I really feel like I'm going super slow at this set.